On Keeping the Sabbath • Run Hard. Rest Well. The work of surrender is mine . . . the work of transformation is His. We find this promise of God’s workmanship in our lives in Ezekiel 36. The promise is trustworthy. The transformation will be visible. Our lives will be rebuilt, cultivated, fortified, replanted. White flags are easy to come by, but hard to raise. Do you have the strength it takes? The power of this week’s theme is not in the words I’ve shared, but what you and God will do behind closed doors or out in the open with a very close friend. Finish up with Ezekiel 36:26-38. 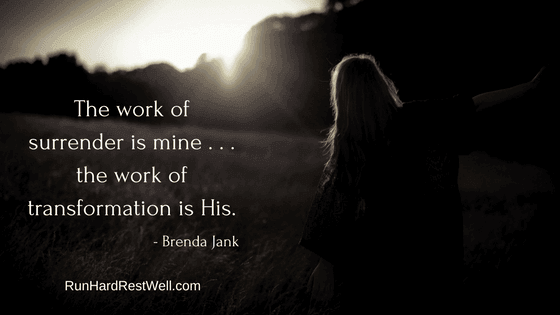 Oh, Brenda, my special friend, I so needed to read his today, and tomorrow, and all weekend. Physically I’m not well…..again. My emotions are jumbled. Yet…..God is near. He gives me the strength I need for the moment. He is the creator of this day, this moment, is season. I’m not lost for He is the Way. The lies must flee….for He is the Truth…the only Truth….the full Truth. In sickness and adversity…He is the Life. As I rest, He is with me. He provides, protects, preserves. What more can I ask for? You special words and scriptures, my friend…and you love. I know these are always there for me and for us all. Jesus provides. Again and again and always. His Word is alive and brings us life. And he comes tenderly to us in our deep weariness … when our hearts are battered and our feet are badly blistered from the long mountain trek. I know, we know, He hears each prayer. Onward — with love and prayers!